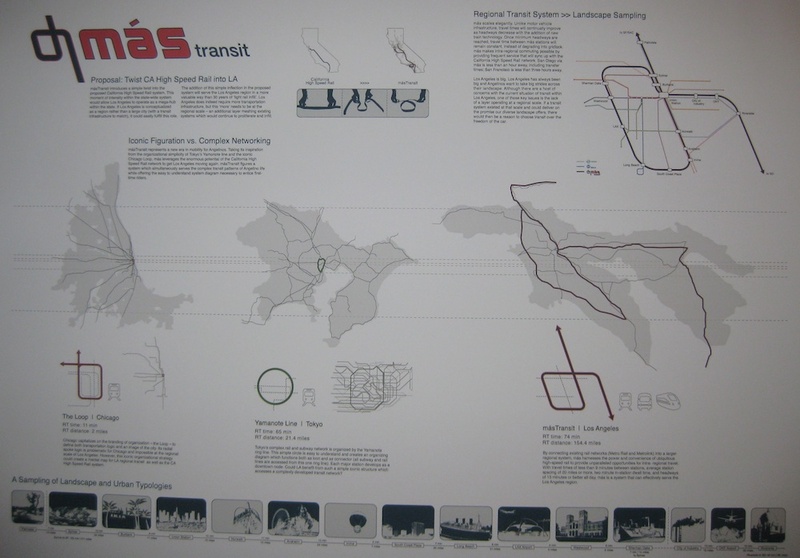 Last week I went to the opening of this fascinating exhibit, which runs through August 28th; railLA is a working group formed by the LA chapters of the American Planning Association and the American Institute of Architects to raise awareness and get people excited about high speed rail. Above, Gunnar Hand, Chair of railLA, speaks with cyclists excited about the possibilities of high speed rail travel. You can listen to the full interview here: Gunner Hand talks about Rail LA at their exhibit opening . Their “ideas” page shows a lot of existing high speed rail stations. I remember seeing the Bologna-Florence line disappear under Mugello Raceway at speeds competitive with the motorcycles on course! This exhibit is the result of that call, and there are a broad range of solutions being offered, including an interactive one. 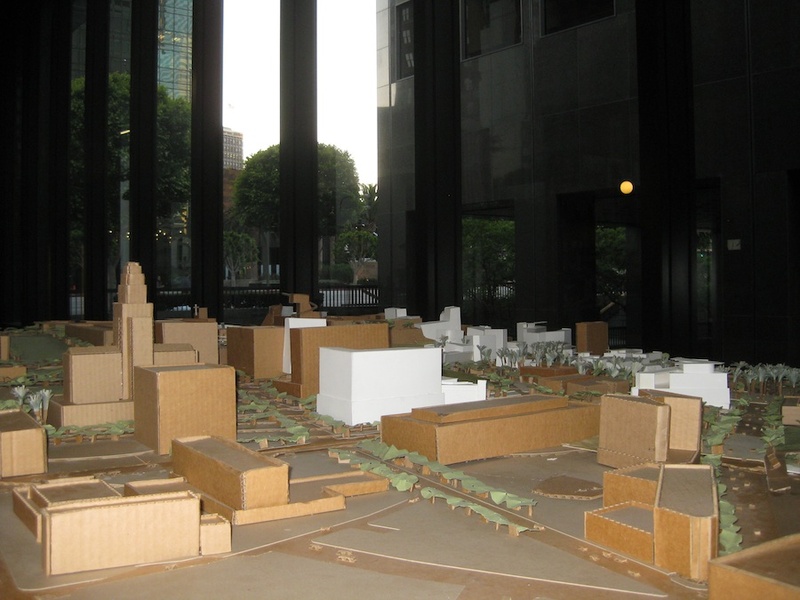 There was a table with movable downtown LA buildings, much like the one above. It was so popular I thought it was the food table, as people rediscovered the joy of playing with blocks. This same table was set up outside the Hive gallery during July’s Downtown Art Walk, as a way to get more of us interested in contributing our feedback. As Rhonda Winter wrote in her article on Obama’s grand plan for high-speed rail, the main value of high-speed rail is connecting long distances, especially for cargo. 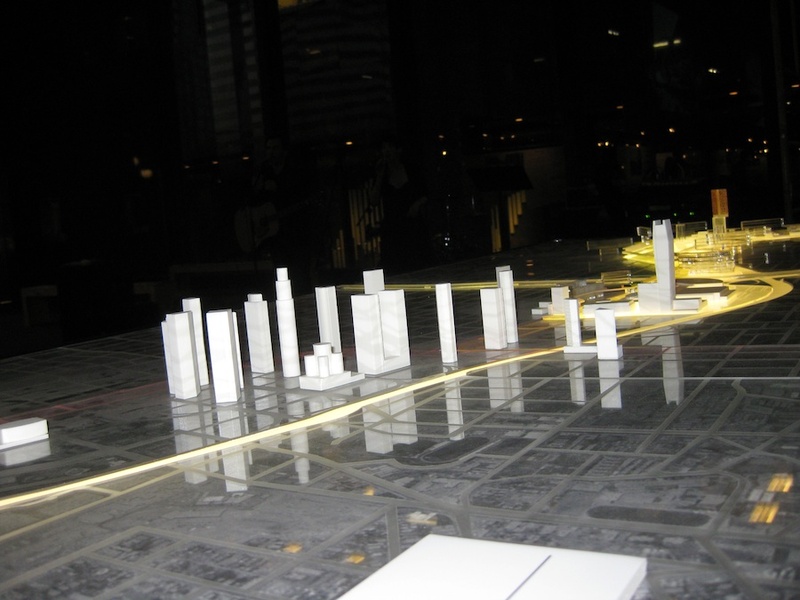 How that impacts LA, however, is interesting because it is such a large, sprawling city; railLA put out a call for works from designers, planners, artists and anyone in the community who wanted to help envision how high-speed rail could best serve Los Angeles. Below are some of the pieces that struck me. Check out the show at 525 South Flower St. in Downtown LA. It’s only a couple blocks from to the 7th street Metro station.